Figs – the Forgotten Fruit! Bright green figs, not yet ripe, hide among the large leaves of a fig bush. When mature, the fruit will change from green to light green, yellow, brown, or purple depending on the variety, and will hang downward rather than pointing up or straight out from the stem. Figs ripen from June through August in our area. If you have never tasted fresh figs then you are missing out on one of the south’s greatest summer treats. Though they are delicious, it can be a challenge to find fig fruits for sale, even at farmer’s markets and farm stands. This is because figs do not store well and have a shelf life of only a few days at best. If you want fresh figs your best option is to plant a fig bush. Luckily, figs thrive in our region and are one of the easiest fruits to grow organically. Figs are typically very productive and easy to grow if a couple of important needs are met. First is sun. Figs produce best in full sun, meaning a location where they get at least a good eight hours of direct sun each day. Next is water. 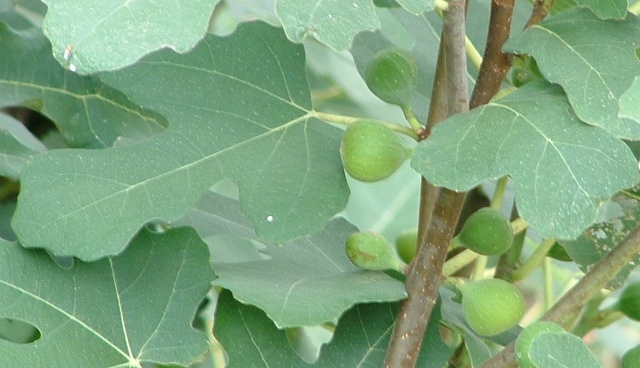 Once established, fig bushes are relatively drought tolerant, but they will often drop fruit during dry weather. To ensure a good crop, figs need a constant supply of moisture. This is best accomplished by amending sandy soils with compost and peat moss before planting, keeping a thick layer of mulch around the bush, and watering during drought. One thing fig do not need much of is fertilizer. In fact, over fertilizing figs can reduce fruit production, cause fruits to split open, and increase cold damage during winter. In very sandy soils, applying slow release fertilizer in the spring will benefit bushes but in clay soil fertilization is rarely needed. Unlike other fruits, figs require little to no pruning. In our climate they more often grow as large shrubs, rather than as trees with a single trunk. Since they can reach several feet in height and width, be sure to give them plenty of room when you plant. The two most common fig varieties you will find for sell locally are ‘Celeste’ and ‘Brown Turkey’. ‘Celeste’ bears small purplish brown, sweet fruit and is a favorite of many fig lovers. The larger, reddish brown fruits of ‘Brown Turkey’ are also tasty, and the preferred choice for preserves. A few less common types you may find for sell include ‘Alma’ and ‘Magnolia’ (also known as ‘Brunswick’). ‘Alma’ produces small fruits, similar in size to ‘Celeste’, that are light yellow when ripe and is another favorite for fresh eating. ‘Magnolia’ has handsome, deeply lobed leaves and produces large bronze fruits often used preserves. Unfortunately the fruits sour quickly in wet weather making it a poor producer in rainy years. Since figs do not require cross pollination you do not have to plant more than one variety. Within a few years a single bush should be able to supply plenty of fresh fruit. Fig varieties are often confused, with the same variety sometimes sold under three or four different names. If you find a fig bush whose fruit you like but you do not know its identity the best thing to do is to ask the owner if you can take a cutting . Figs are very easy to root from cuttings taken during winter or summer. In winter take six to eight inch long cuttings. Stick them in sandy soil or a container of potting soil in a shady area outside and wait until they leaf out in spring to transplant. Cuttings taken in summer should be stuck in a container of potting soil, watered well and placed inside a plastic bag to maintain high humidity. Put the container in a shady spot, where the cuttings should root in four to six weeks. Figs can also be layered by pulling a lower branch down to the ground in spring. Partially bury part of the branch, several inches back from the tip or place a brick on the branch to keep it contact with the soil. It will produce roots and can be transplanted the following spring. Newly planted bushes will begin to bear fruit a few years after planting. Figs are rarely bothered by insects or plant diseases, though root knot nematodes can be a problem. Nematodes are microscopic worms that live in the soil. They enter plant roots and feed on plants much like leeches do on animals. Nematodes rarely kill fig plants but do cause them to drop fruit and stunt their growth. This pest is more common in sandy soils. There is no way to eradicate nematodes from the soil, though amending soils heavily with compost before planting, mulching, and watering will help plants cope with the stress they cause. The only other problem figs sometimes experience in our area is cold damage. This is more common in particularly cold winters or when extremely cold temperatures follow a stretch of unseasonably mild weather in late winter. It is very rare for figs to be killed completely, though they may have to be cut back to the ground and allowed to re-grow if heavily damaged. Cold damage can be minimized by planting fig bushes against a south facing wall. If you live in Pender County, call 259-1235. In New Hanover County, call 798-7660. Visit http://pender.ces.ncsu.edu/ to post your questions to be answered by Extension’s ‘Ask an Expert’ widget. Visit the Pender Gardener blog to stay up to date with all the latest gardening news, http://pendergardener.blogspot.com/. Email Listserves – sign up to receive weekly email updates! Regular updates on what to do and plant in your landscape and lawn! Regular updates on what to do and plant in your vegetable and herb garden!